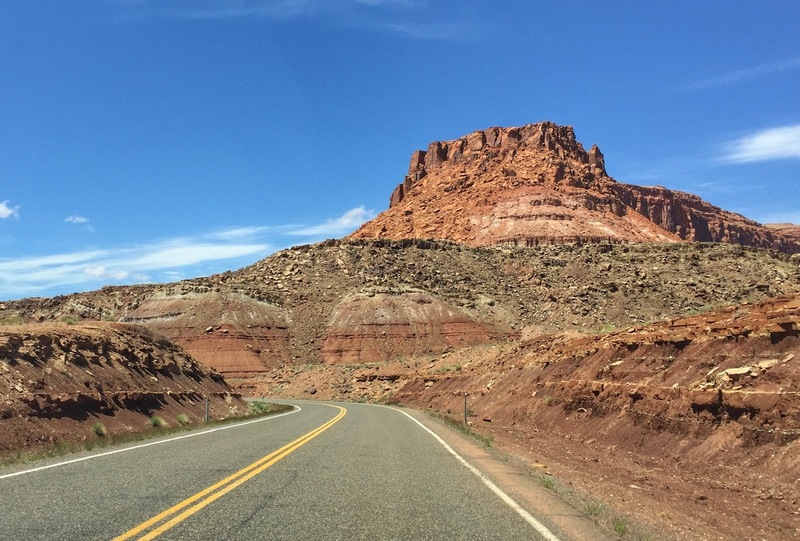 After a stop for fuel, we departed Blanding this morning and headed west on UT-95, another road marked on our AAA map as a scenic highway. Though we've found that designation misapplied on some of their maps, this one turned out to be an understatement. 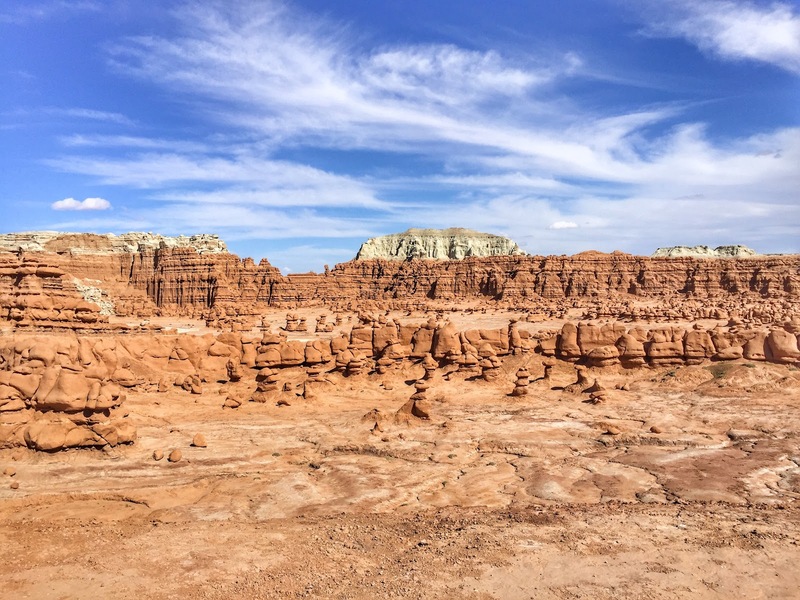 Our first stop was Natural Bridges National Monument, just 40 miles away. 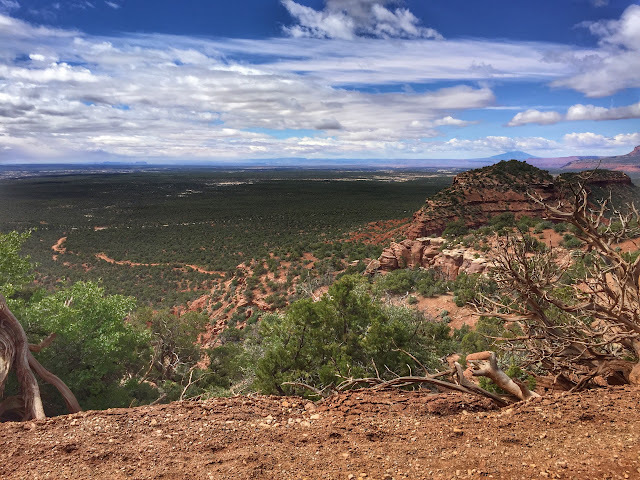 The park sits high atop Cedar Mesa at 6,500 ft above sea level. 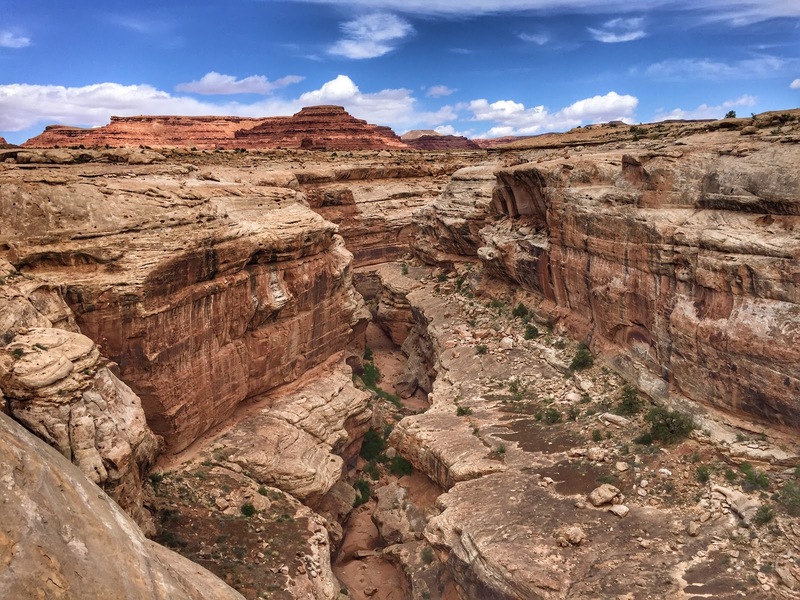 Over many millennia, intermittent streams have cut two deep canyons in sandstone formed from the shore of an ancient sea. The erosive action of the water also created three natural bridges. With a full agenda and more than 200 miles to go today, we opted against hiking to any of the bridges and only viewed them from the overlooks. In the interest of full disclosure, temps in the low 40s, bone-chilling wind and drizzling rain might have also played a part in that decision. 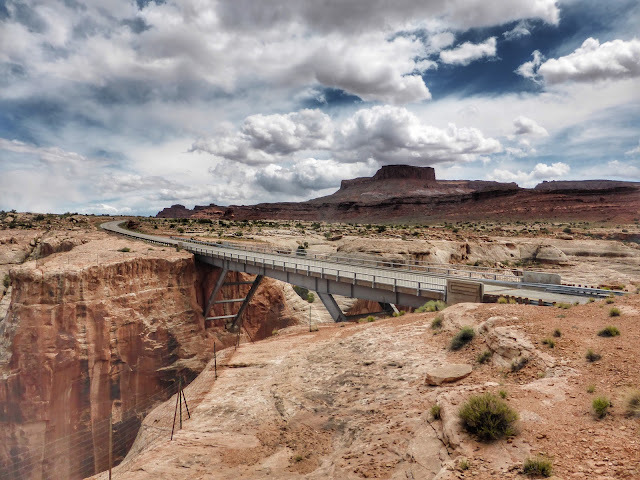 Sipapu Bridge is believed to be the second largest natural bridge in the world. The largest is nearby Rainbow Bridge, itself a national monument, which is located in a remote area accessible by an 8-hour boat ride or a 14-hour (one-way) hike. 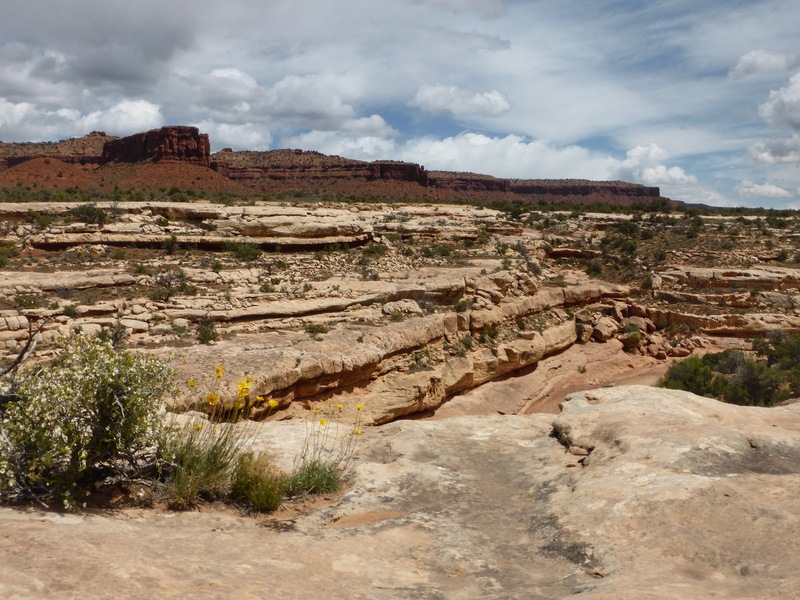 Kachina Bridge is the youngest of the three in the Natural Bridges park. Thus its opening is relatively small. It is named for rock art symbols that resemble kachina dolls. Owachomo Bridge is the oldest and is no longer being eroded by moving water though frost and seeping water continue to have an effect. Scientists believe the bridge may have a fatal crack. Only time will tell. 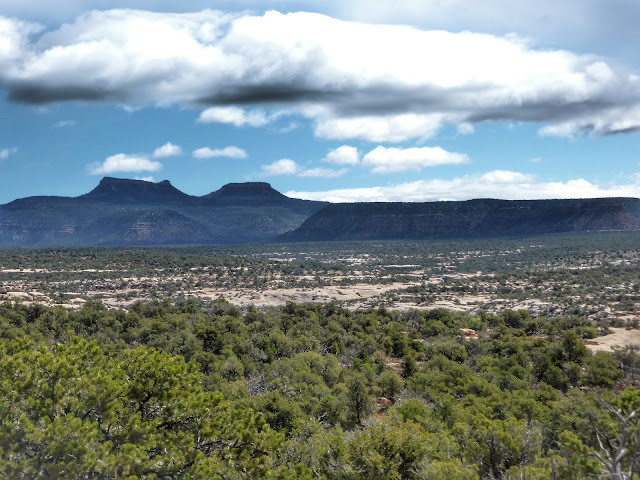 On the approach road to Natural Bridges, we had seen a sign indicating "Bears Ears 6 miles". 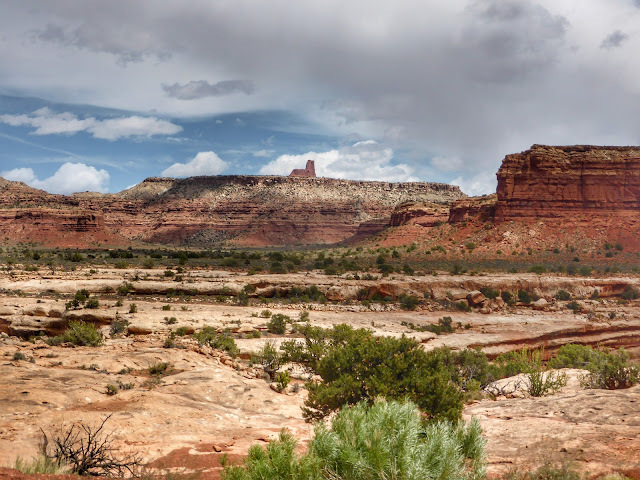 Bears Ears are the two prominent buttes in the distance in the above photo. 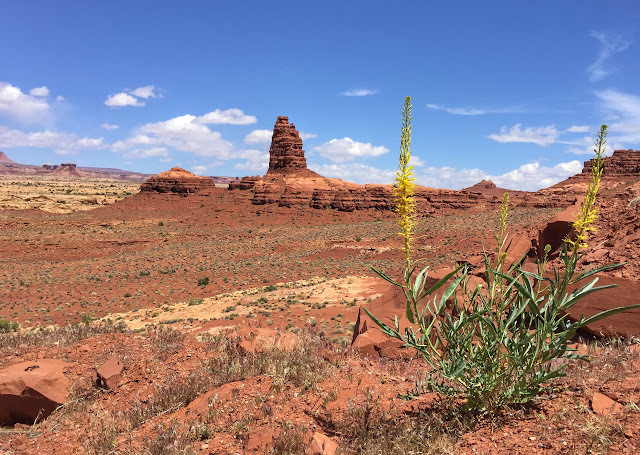 Several Native American groups consider this area sacred and include it in their oral traditions. 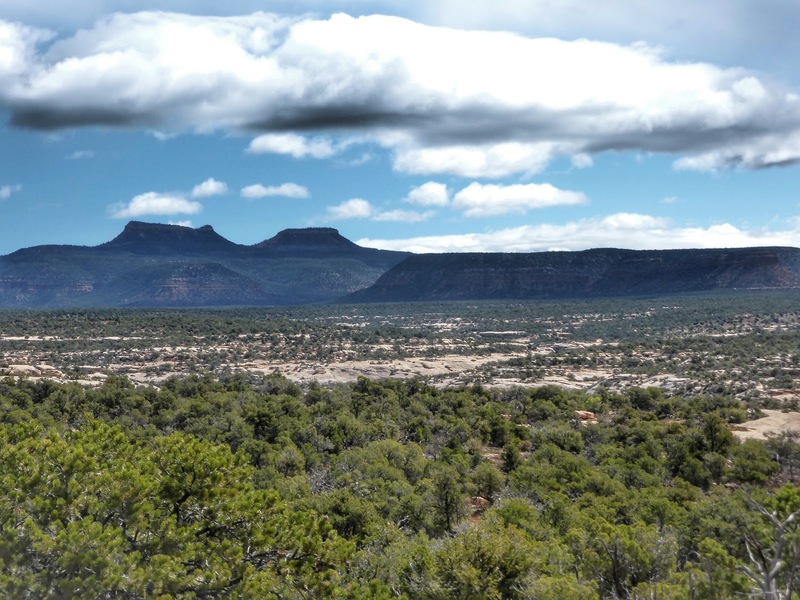 Peaking at 9,000 feet, the buttes can be seen from as far east as Mesa Verde National Park in Colorado and as far south as Monument Valley in Arizona. 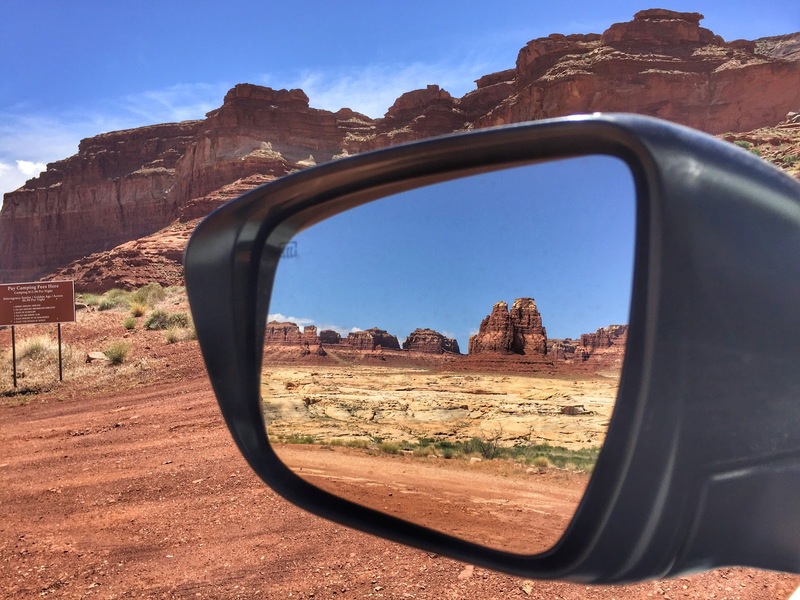 For centuries, Bears Ears have served as important landmarks for travel within what we now call the Four Corners region. In response to appeals from local conservationists and native tribes, President Obama designated Bears Ears a national monument in one of his last executive orders while in office. 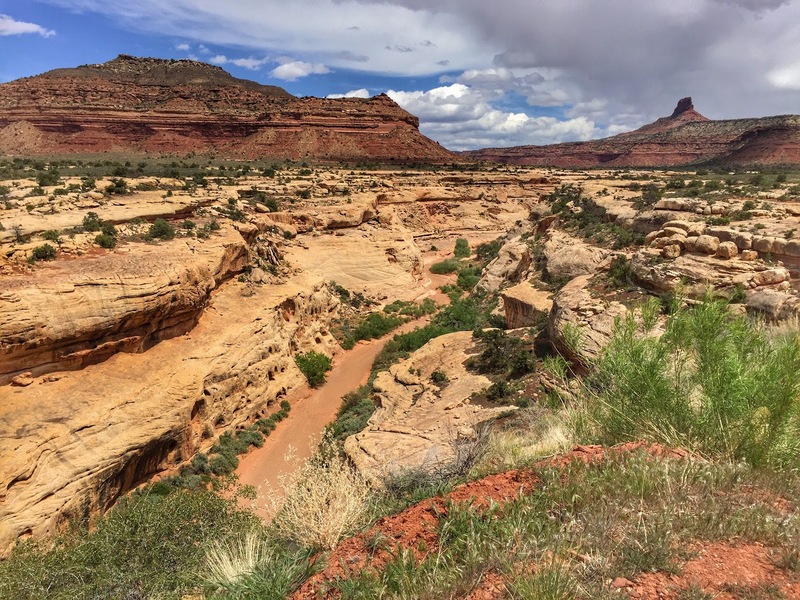 As has been widely reported recently, Bears Ears is one of many public land treasures that President Trump is considering curbing protection of by revoking their designations as national monuments. We decided to go check out the ears before they lose their status. The road to Bears Ears turned out to be a bit more treacherous than we expected, so what we thought would be a ten-minute detour took quite a bit longer. However, we were well rewarded when we reached the top with a close up view of the two ears. We decided to plant a letterbox there, and while we were preparing it, a twenty-something long-haired New Yorker showed up in his camper pickup. "What is there to see?" he asked, and we pointed out the location of each of the ears. The next thing we knew, he had taken off walking up the hill toward the left ear. 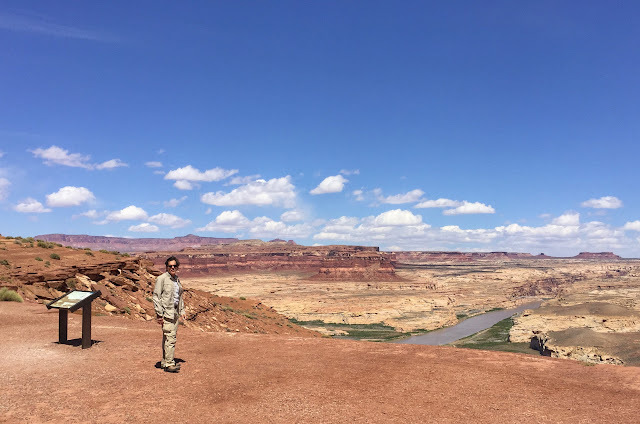 The last time we saw him before we left, he was at the base of the rocky peak trying to figure out how to climb higher—with no gear, no water, no apparent plan. We're hoping we don't hear any news reports about someone falling from Bears Ears. Before leaving the area we found a 2008 letterbox off the road to Natural Bridges that was planted by a couple from Pensacola. 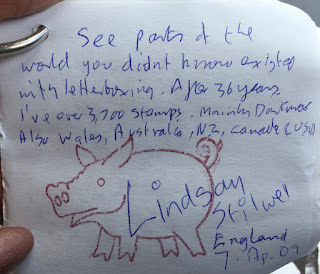 Inside the logbook was a note from a finder who said she had been letterboxing for 36 years. Since the hobby didn't start in the U.S. until 1998, we were struggling to make the math work until we noticed that she was from England, where letterboxing began in the 19th century. 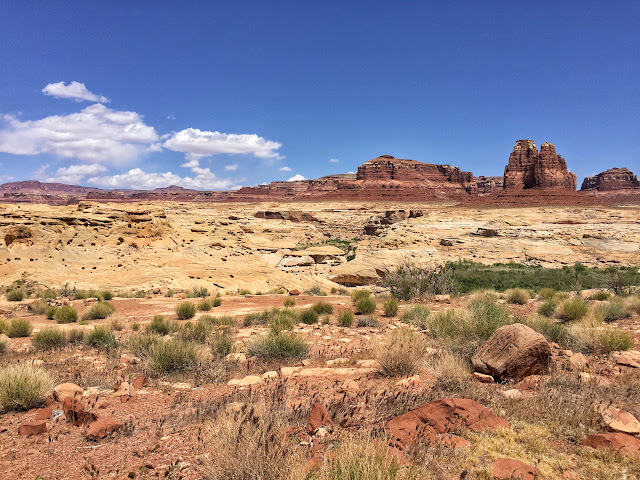 We continued northwest on UT-95 through the stunning White Canyon and into the Glen Canyon National Recreation Area and around the mostly dry north end of Lake Powell, treated to one picturesque scene after another. The mind could hardly comprehend the panoramic richness the eyes were seeing. When we reached the turnoff to Ticaboo and Bullfrog, we actually breathed a sigh of relief, exclaiming in near unison, "Finally! Some ordinary scenery." 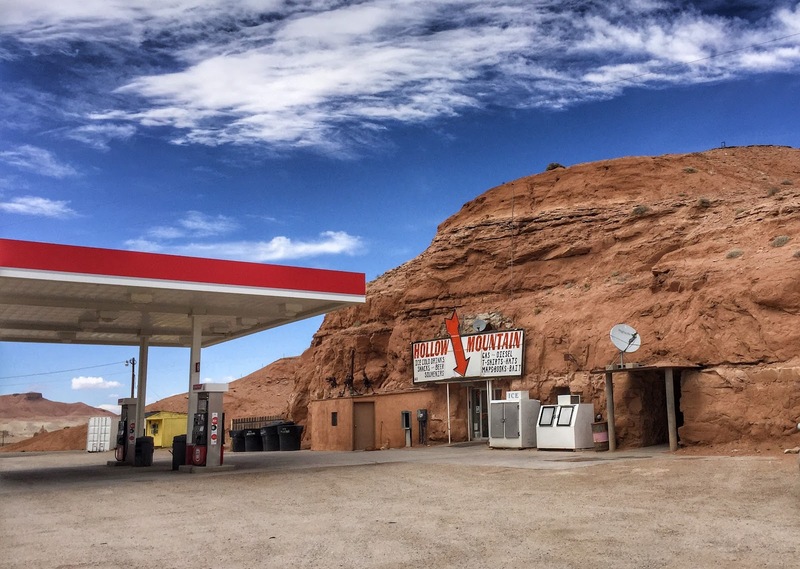 Of course, what we were seeing would never pass for mundane anywhere but Utah. In Hanksville, we turned east on UT-24 for a side trip to Goblin Valley State Park, where the forces of nature have sculpted sandstone "goblins" on the floor of a desert valley surrounded by eroded cliffs. We arrived on an extremely blustery day in the park. We just thought we had seen wind at Grand Canyon. With gusts of 45 to 50 mph, it was difficult at times to remain upright and the blowing dust made breathing a challenge. 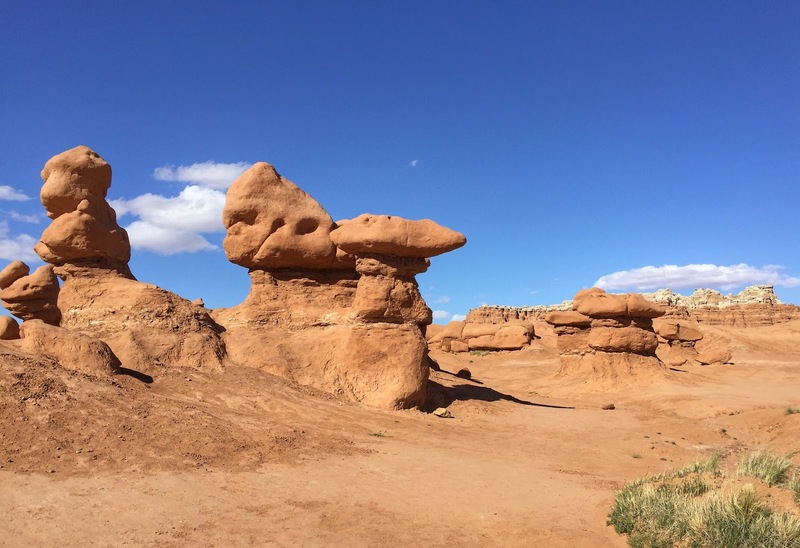 Luckily these desert gnomes were so appealing that visitors were willing to forge ahead down the rough-hewn stairs into the valley for close encounters with these fanciful formations. We left the park at 5:30 with 76 miles to our hotel near Capitol Reef National Park. Not to belabor a point, but the scenery along UT-24 on the way to the park was even more dramatically majestic than what we had already seen today. We can't wait until tomorrow when we'll have better light and can see more of the Capitol Reef area. Loved: We've come to enjoy naming rock formations based on their shapes—turtle head, mushroom, lion, boneyard, dragon, castle, temple, etc. When we see a sign designating a landform with the same name we gave it, it's just a bonus. Lacking: Again we were disappointed with the lack of pullouts for scenic overviews. 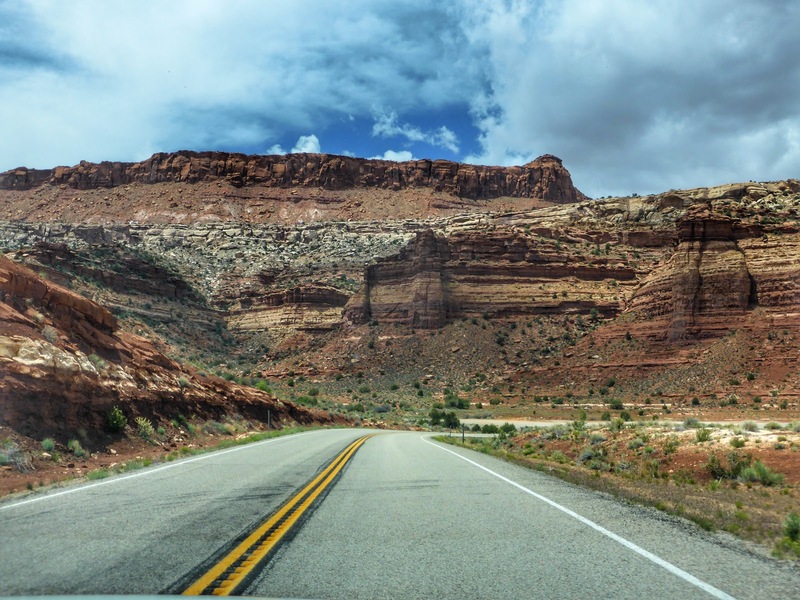 But realistically there are so many breathtaking vistas along the route, the only way to accommodate sightseers would be an extra lane in both directions just for rubberneckers. Learned: Having heard the terms 'arch' and 'natural bridge' used for stone features which looked the same, we thought the terms were interchangeable. Until we visited Natural Bridges National Monument today. There we learned that natural bridges are formed by the erosive action of moving water. Arches are created by other erosional forces, mainly frost action and seeping water. Do you see Jacob's Chair?